BSX Records presents the soundtrack to HOUSE AT THE END OF THE DRIVE, featuring music composed and performed by Alan Howarth for the 2012 horror film directed by David Worth, written by David Oman and Jim Vines, starring James Oliver, Alison Raimondi, Angela Jones, John Dylan Howard, Marco Greco, Ellen Geer, Gizelle D’Cole, Yusuf Gatewood, Paydin LoPachin, Lisa Diane Morgan, Via Osgood, Jessica Szohr and Lance Henriksen. HOUSE AT THE END OF THE DRIVE tells the story of new homeowner David King and his family as they begin to experience what can only be described as paranormal phenomenon in their new home on Cielo Drive. As the ghosts begin to make themselves known on the night of a quiet dinner party with David and his friends, they find themselves lured towards the house at the end of the drive, known to be the setting for a series of gruesome murders 36 years earlier. Once inside the house, supernatural forces from the past transport David and his friends through Time, back to the night of the original killings. In a cruel twist of fate, they materialize as the soon-to-be victims of the massacre they had just been discussing minutes earlier. Is the knowledge of the future enough to shield them from the mayhem from the past? When it came time to score HOUSE AT THE END OF THE DRIVE, Oman was referred to composer Alan Howarth by David Worth, the director of the film, who had served as director of photography on an earlier project Alan had scored. The story of HOUSE AT THE END OF THE DRIVE would offer a composer the opportunity to explore two separate worlds of sound in scoring the film. The present day and the world of 1969. As a child of 1969 and a musician, Howarth embraced the opportunity. The story’s modern era is dominated by threatening musical textures and chilling ambiances that unnerve the viewer as the ghosts of Cielo Drive begin to make themselves known while the scoring for the world of 1969 has more of a rock vibe, with guitars and drums, which included producing a half-dozen 1969-style folk-rock tunes for the project. 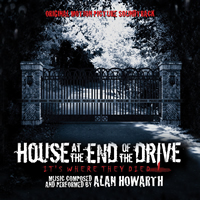 BSX Records presents THE HOUSE AT THE END OF THE DRIVE , featuring music composed and performed by Alan Howarth. The booklet contains liner notes written by noted author Randall Larson, including insights by composer Alan Howarth on the creation of the score for this unique horror film. This title is running slightly behind schedule as we wait for a printing error on the disc label to be corrected by the manufacturer. This title is now expected to start shipping by 10/4/13. We apologise for any inconvenience.